To celebrate the upcoming Paper Magic's audio book we have revamped the cover of the print and e-books. This week, I am the featured author on the Writing For Kids website. Children's author, Dee White has put together a great piece to go with my writing tips for kids. come along and join in the fun . A box full of Paper Magic print books arrived today. Very exciting feeling opening the parcel and holding the first copy in my hands. I will contact those who pre-ordered copies. For those who didn't, the books will be available very soon. The final proof from the printer is spectacular and approval for the first print run of Paper Magic has been given. 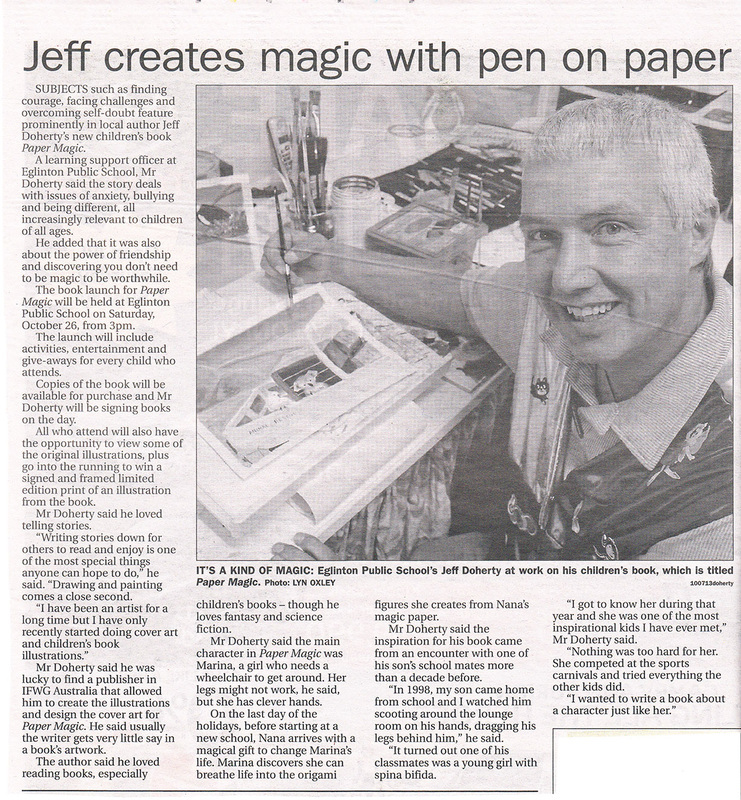 The Book Launch for Paper Magic will be held at the Eglinton Public School on Saturday the 26th of October, 2013. You are all invited to attend. I have just received the e-book versions of Paper Magic to send out as review copies. However, the e-book version is not going on sale until closer to the release of the print version. The cover Template has been sent from the printers with the calculated spine width. I'm working on fitting the cover art to the template now. Then let the presses roll. I came home from work today to find the proof copy of Paper Magic had arrived from the designers. The internals look wonderful, better than I imagined. Maria and I poured over the text looking for any errors. One typo discovered and corrected and the proof has been returned to the editor for submission to the printers. I have just exchanged a bunch of emails with my editor regarding the internals for Paper Magic. The final block should be in any day now. Paper Magic is currently being formatted for printing. As soon as the page layouts are complete, I will get a book block to review and then it is off to the printers. I have received notification from IFWG Publishing Australia of the issue of my ISBN and Dewey numbers for Paper Magic. IFWG have announced their new Australian imprint of the publishing company and the books they will be releasing in the next few months. Paper Magic is second cab off the rank. At this time, IFWG Publishing do not do audio versions of their books though it is something they are contemplating for the future. I have negotiated to keep the audio rights to Paper Magic and I am currently preparing to produce an audio version of the book. I have received some good news from Gerry at IFWG Publishing. It seems the printing arm of the company is back in the game. I should hear in the next week or so about the progress of Paper Magic in the printing queue. I have been asked to be a guest author/illustrator at the Orange heat of the Kids' Lit Quiz on the 20th February. I'm looking forward to meeting kids who are passionate about reading. Final edits of Paper Magic are complete and ready to be sent to the block designer. I'm just doing another read through and proof before that happens. This is getting exciting now. All of the illustrations for Paper Magic have been re-scanned and formatted for inclusion in the typesetting of the book. Due to a number of unforeseen and unavoidable situations over the last few months, including Hurricane Sandy, IFWG Publishing's release schedule has been delayed by four to six weeks. This means the publication date for Paper Magic will be pushed back to late January 2013 instead of December 2012. A tale of acceptance. Acceptance of self, and of others. Paper Magic will teach your child that it is OK to be different; to be you. There is a little magic in everyone, if only we all shared it. This book is a stunning piece of poetry to show children how to see the magic in life. It tells us how we are only limited by our imagination, not by what we are given. Doherty's writing is pure and picturesque, using the simplest of phrases to conjure up the most complex of images. I'm looking forward to reading more. Marina’s nimble fingers fold the magic paper that Nana gave her and soon a beautiful butterfly ‘pulses with life.’ She is clever with her hands and her arms are strong but how she wishes her useless legs could run and jump like other kids. When Nana arrives and takes Marina on an adventure in her wheel chair to the local park she realizes that if she is to overcome the fear of rejection and become the person she wants to be, she must push beyond her comfort zone to discover an inner magic. Through this process of self – discovery Marina gains new insight and perhaps even some new friends. This quietly engaging chapter book draws from Doherty’s years of experience working with kids with special needs. It is a story about courage and the overcoming of adversity. Suitable 7-10 years. Follow courageous Marina on a fantastical journey in this sweet, heartfelt book. Well written and full of suspense, this purchase won't be a disappointment and you'll find yourself re-reading this lovely magical story. This book would make a great read-aloud or a gift for a child who might be in need a story about courage. 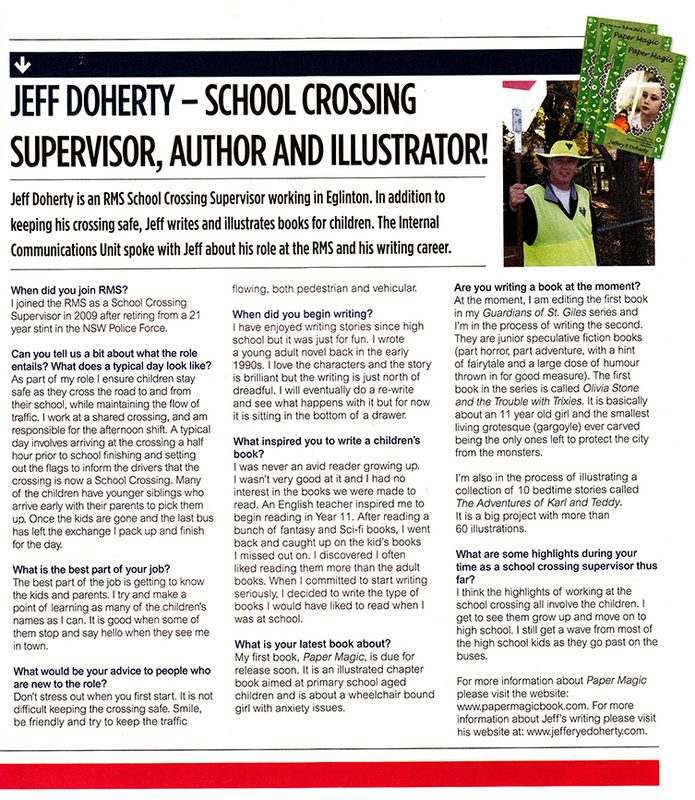 Our visiting author today, Jeffery E Doherty is also a very talented illustrator. Jeffery writes short stories, chapter books, picture books, junior and young adult novels. Today’s writing tips are based on the creation of his book, Paper Magic. Today's official launch of Paper Magic. Was very successful with over 140 people in attendance. Thanks to Books Plus Bathurst for looking after sales on the day. Also a big thanks to Eglinton Public School for allowing me to hold the launch at the school. Author of "I Love You 5 Lollipops"
Paper Magic is a gently delightful tale of a little girl overcoming the limitations she carries in her heart that are far more crippling than the limitations that keep her in her wheelchair. With the aid of some very special origami paper, her nimble fingers, an encouraging grandmother, and just a touch more magical imagination than other children, Marina turns a day full of anxiety into one of wonder. Great for helping kids prepare for new situations, especially new schools or neighborhoods. The illustrations are a treat, too. My favourite part of Paper Magic was when the boys said they would go easy on the girls in basketball but the girls ended up beating the boys. I felt like I was there in the book listening to the kids in the playground. "You've written a beautiful first book. There is magic in the air, in the origami paper Marina folds and between the pages of this book. Sometimes courage, like Marina's wheelchair, just needs a little push... whether it's a trip to the park or the first day at a new school. Paper Magic is an inspiring story about the power of friendship." "...It made me feel like I was in your book; watching, smelling, tasting, feeling and hearing everything that happened. I loved your book because it was really touching and emotional..."
Paper Magic is a delightful, visually rich and original tale about Marina, a wheelchair bound youngster, longing to play with the kids in the park but doesn't think she can, until her grandmother gives her a magical pad of paper and shows her how to bring life to the origami shapes she creates. Inspired by her new-found magic, Marina takes the courageous step of visiting the park. 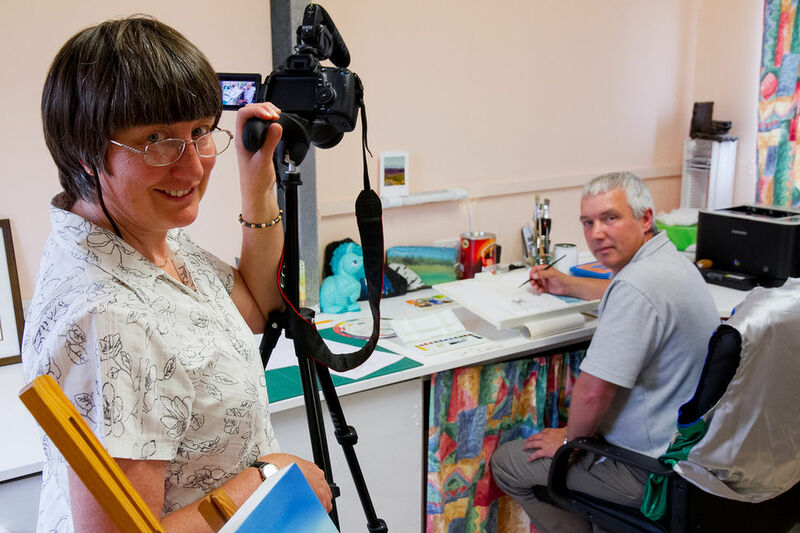 Here she meets new friends, helps out others who are struggling too and faces some challenges along the way. Children from seven to eleven will be delighted by Marina's magical creations, inspired by her courage to face her fears and will find that real magic exists in friendship. Oh, and they will probably be nagging Mum and Dad for some magic paper to make a boat! I love this line: "Part of her wants to race back to the window seat, safe in her room, but another, bigger part longs to follow the Pied Piper sounds of children playing in the park". This creates such great imagery in my mind of her being drawn to the magical and alluring calls of the kids in the park. Nice one!